Smudging Sprays What is Smudging? Juniper Lemongrass Breeze Copal Sticks used for smudging/ burning. Measure approximately 6" in length, lengths may vary. We also carry copal resin, again for smudging/ burning. Priced at $3.75 per stick. Lavender has been used for centuries as an herbal remedy. It was used for everything from relief of muscular aches, pains and sprains, inducing peaceful slumber, relaxing the nerves and mind. It has been stated to have antiseptic, anti-bacterial, anti-fungal, anti-inflammatory, anti-convulsive, and anti-depressant properties. This White Sage Bundle measures approximately 4-6 inches in length. White Sage has long been used in the Native American culture for its clearing of negative energy and releasing of all things unwanted in order to bring forth a sense of balance and harmony. Chaparral smudge stick. Chaparral smells like the cool breeze after a desert shower. Measures approximately 6" in length, lengths may vary. 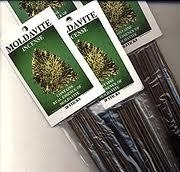 Mugwart Smudge Sticks measure approximately 6" in length, lengths may vary. Useful for enhancing psychic enhancement and capabilities. Yerba Santa Smudge Stick measures approximately 6" in length, lengths may vary. 100% Pure, natural, wild-crafted, hand-picked by sacred practice. 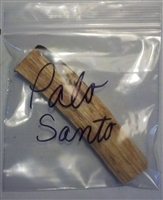 Palo Santo wood is sacred and excellent for smudging. Measure approximately 5" in length, lengths may vary. Our White Sage Smudge Cones are made of California White Sage. They are not made with sawdust soaked in sage oil nor with ground charcoal or pine sap to keep them burning. They smell SOLELY of white sage because ONLY the natural plant's Natural Oils keep them smoldering. Black Hummingbird Sage smudge stick harvested near the Four-corners in Colorado. Approximately 6 inches in length. Lengths may vary. 100% Pure, natural, wild-crafted, hand-picked by sacred practice. Moldavite is the product of a meteor collision with Earth nearly 15 million years ago. In legend, it is believed Moldavite was the green stone in the Holy Grail and has the power to quicken one's spiritual evolution. Even those not sensitive to the energies of stones, often feel the energy of Moldavite. Many sense it as heat, tingling or pulsing sensation and even a rush of energy through their bodies typically upwards out the top of their head. Qty: 20 sticks per package Sixth Sense Smudge Stick is a unique, detoxifying combination of Desert Sage, Cedar, Lavender, Copal, Sweetgrass and White Sage. Each stick measures approximately 6" in length, lengths may vary. 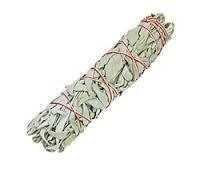 This White Sage Bundle measures approximately 7-9 inches in length. White Sage has long been used in the Native American culture for its clearing of negative energy and releasing of all things unwanted in order to bring forth a sense of balance and harmony. Its uses; cleansing one's self, cleansing others or a group, cleansing a home, cleanse those in dis-ease, cleansing animals, during a Full-Moon & New-Moon, etc... Our Sweetgrass is harvested in Canada. This batch of braided Sweetgrass is very potent and green and measures approximately 21" - 24" in length, lengths may vary slightly. Useful in smudging ceremonies to cleanse the air of negativity, purifying objects-people and animals. Smudging relaxes and calms the mind allowing one to meditate more fully and focus on the task at hand. Smudge rooms for 15 to 20 minutes before gatherings when you wish to help people become calm and settled. Rosemary Smudge Stick measures approximately 6" in length, lengths may vary.